Wondering what the current official name of PowerDesigner? S-Designor ? PowerAMC? What is the latest version? 1989 SDP AMC*Designor 2.0 The first commercial is release in France by SDP (Suresne), under the name: AMC*Designor 2. The “OR” stands for Oracle, the first database targeted by SDP. 1992 SDP S-Designor 3.0 SDP expands their business abroad and publish a first version dedicated to the US market called S-Designor 3. The main reason for a different version is that the most popular analysis methodology in France at that time (MERISE) was not used in the US, hence a different set of models and features for both products. 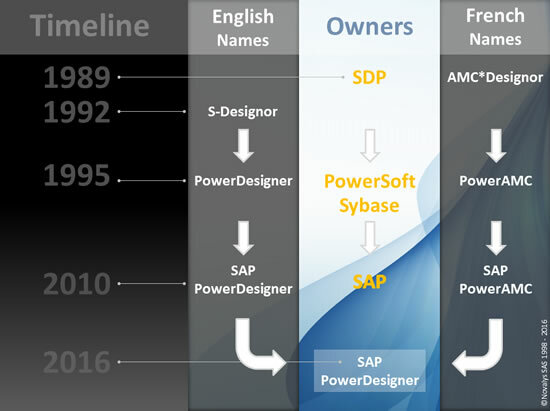 1995 PowerSoft PowerDesigner PowerSoft acquires SDP in 1995 and renames S-Designor to PowerDesigner, for a matter of consistency with the brands PowerBuilder and Powersoft. PowerSoft had been taken over by sybase in 1994, and was still operating as a Sybase subsidiary and owner of Powerdesigner at that time. Future versions of the product will be released under the Sybase umbrella, without the name PowerSoft. 1995 PowerSoft PowerAMC AMC*Designor becomes PowerAMC. 2011 Sybase, a SAP company PowerDesigner 16.0 SAP acquires Sybase in 2010. As for PowerSoft, the first version is released under the name of the previous owner. Future versions will include the prefix SAP. New Shell, Role based UI, Glossary, Impact analysis on repository, Sybase IQ reference architecture wizard. 2016 SAP PowerDesigner 16.6 PowerAMC is no longer available as a separate product. The features of the 2 editions were similar for several years. They are now delivered with a single installer, but the user can choose the installation language. 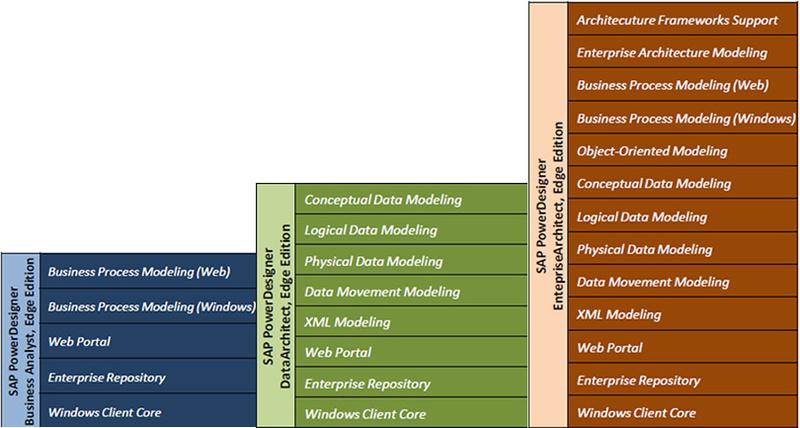 PowerDesigner comes with several Editions (DataArchitect, EnterpriseArchitect…) and was available with different licensing models (simplified since version 16.6). Some of them were deprecated by SAP, others are still valid. This may create some confusion as to which edition, type of license and capacity is the right fit for a given project. Below are some definitions to clarify this matter. The concurrent Session License is controlled by a local SYSAM server that the user must install first. (DM stands for Data Manager = without Repository). 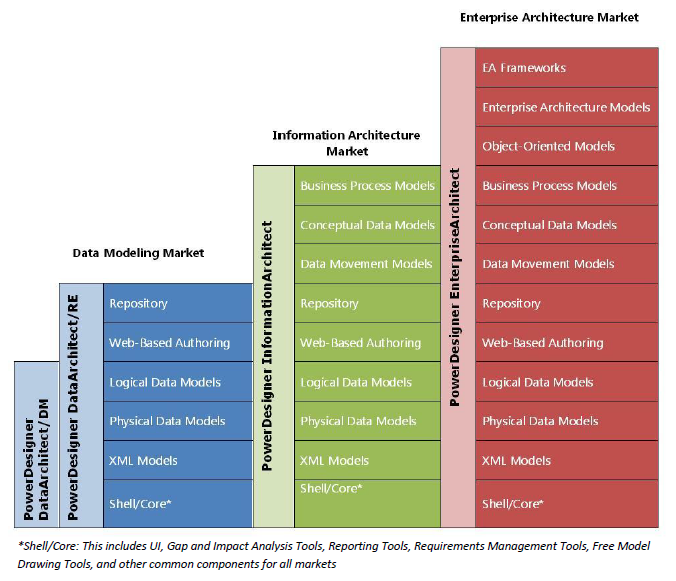 This edition was a superset of the DataArchitect Edition, combining data modeling and business process modeling (see “Old PowerDesigner Edition Schema” below). PowerAMC was the French Edition of PowerDesigner. Since version 16.6, only PowerDesigner remain available, but the software is now available in French as well (the user can choose the installation language - Read more).